We’d love your help. 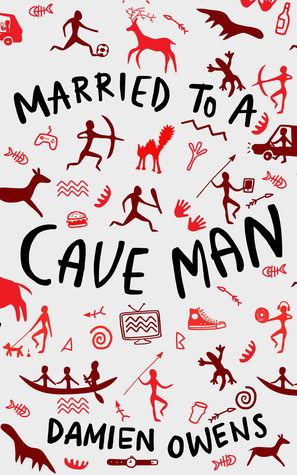 Let us know what’s wrong with this preview of Married to a Cave Man by Damien Owens. To ask other readers questions about Married to a Cave Man, please sign up. Simply love it! First of all, I have to thank The Pigeonhole and the author Damien Owens for the opportunity to read this novel. A fast paced read about the struggles of marriage and paternal hood. I really like the author style and the humour he puts in it even when discussing difficult topics as infertility, depression, struggle to cope with children upgrowing and also infidelity. At some point I had to stop reading because I end up in tears for laughing. As I said I really enjoyed it even tho Simply love it! First of all, I have to thank The Pigeonhole and the author Damien Owens for the opportunity to read this novel. A fast paced read about the struggles of marriage and paternal hood. I really like the author style and the humour he puts in it even when discussing difficult topics as infertility, depression, struggle to cope with children upgrowing and also infidelity. At some point I had to stop reading because I end up in tears for laughing. As I said I really enjoyed it even though I am not married either a parent myself, it makes me wonder how I am ready to judge parents when their children are not behaving, not having the sightless clue how much pressure they are under, instead of judging I should sympathized with them. I really liked the main characters, even though they had their flaws they were realistic. The novel is about three couples, Dooley and Julie, Redmond and Nancy, Leo and Deirdre. The three couples live in the same neighbourhood, apart for the pleasant nods they do not know each other. They all have in common the fact that they are going through a hard time. One evening Redmond and Dooley met and ending up talking about their wives and complain that they don’t understand that a man needs his space and Dooley came with the idea of the caveman place. He will soon discover that this idea would lead to a disaster. Will the couples survive or it will be the end of their marriages? Nancy and Redmond, Leo and Deidre, and Julie and Dooley - all married, and all going through their own life problems, The book starts off finding out how each of the couples meet, the fast-forwards a few years to find out how their relationships have developed. Nancy, who always made a point of saying children needed their mothers at home full time in their preschool years, is stressed out of her mind looking after her two young boys and longs to go back to work. Redmond, deeply unhappy in his jo Nancy and Redmond, Leo and Deidre, and Julie and Dooley - all married, and all going through their own life problems, The book starts off finding out how each of the couples meet, the fast-forwards a few years to find out how their relationships have developed. Nancy, who always made a point of saying children needed their mothers at home full time in their preschool years, is stressed out of her mind looking after her two young boys and longs to go back to work. Redmond, deeply unhappy in his job, doesn't know how to treat his miserable wife. Leo and Deidre have their own battles to fight. Leo has been unemployed for months and has effectively given up on everything apart from listening to his beloved records. Deidre, now the breadwinner, is desperate for a baby but, for no apparent reason, her and Leo cannot conceive a child. Julie and Dooley seem to have the perfect life - she works as a senior account manager in a lucrative advertising firm while Dooley looks after their baby daughter. But when eyes start to wander, their marriage feels the pressure. What man doesn’t want a man cave? A place that’s all yours where you can hang out with your friends and drink or watch sports or whatever you do in there. But what if the wife doesn’t like that idea and your whole world seems to fall apart? Three different men, all neighbors, find out what happens when they try to carve out a little space of their own. Instead of a little piece of heaven, they find out, along with their wives, that marriage is not always easy and that sometimes you have to make What man doesn’t want a man cave? A place that’s all yours where you can hang out with your friends and drink or watch sports or whatever you do in there. But what if the wife doesn’t like that idea and your whole world seems to fall apart? Three different men, all neighbors, find out what happens when they try to carve out a little space of their own. Instead of a little piece of heaven, they find out, along with their wives, that marriage is not always easy and that sometimes you have to make compromises and adult decisions. There you go, see? THIS is how you combine humour with real human drama and emotion. Here it is. I became drawn to this book mostly due to the cover and also the fact that it is a contemporary fiction about marriage written by a male author, which I feel is not very common. When all of the characters were introduced at the beginning of the novel, I felt that I might get confused between them. However, this was not the case and I found that they were all distinct and had their own personalities. Each member of the three couples that the story follows almost seemed like a stereotype usually found in romantic comedies but portrayed in a much more realistic way. I felt that the dramas that happened were understandable and were resolved in relatively realistic ways. Read this via Pigeonhole. Really enjoyable, and made me happy I am single. This is a story of three married couples as they try to deal with various different aspects in their married life. What ends up tying them all together is 'the man cave', that little area for the men to relax, unwind, whatever they may need. What I liked at the very start was how the author introduced the couples, which was of course their first meeting, I loved this because although a sho Thank You to NetGalley and the publishers for providing me with a free copy in exchange for an honest review. What I liked at the very start was how the author introduced the couples, which was of course their first meeting, I loved this because although a short introductory chapter it gives you a vital piece of history as well as letting you know what everyone thought of each other at first glance. For me that really drew me into the story, most likely as I'm incredible nosy and love to find out how things turn out. After we did get past the initial meetings and onto the real nitty gritty parts, I did find it hard at times to keep up with who was who, now there are six characters main characters to follow and just for the first few chapters at least I did struggle a tad to remember who was married to who. Once I did figure all that out, it was easy to see the different dynamics, different struggles and different personalities which were all fairly fleshed out. It did also lead to a lot more internal screaming towards every single character as no one was able to see any of the problems their spouses were facing. Now this might just be because as a reader it can be pretty easy to tell what's going on, especially with all that internal dialogue, but my goodness I was definitely getting more than a little irritated at times. If you have ever wanted to bash your significant other around the head with a blunt instrument one moment and in the next instance wondered if you might actually be married to a real life superhero because you are so in awe of them, then you will identify with this book. We all love our other halves, right? But crikey oh blimey they know how to push our buttons. So many “romance books” (not sure this entirely falls into that category, but for argument's sake) are about the chase. They are about the 'boy meets girl', the desperate tumble into love, the overcoming of inevitable disaster, etc. What I loved about this book is that it picks up where most others end off. We meet these 3 couples when they’ve done the falling in love part a long time ago and are now well into the humdrum of daily life. And so this book, in a funny but delicate way, looks at the trials and tribulations of marriage and family life. How couples support each other through some of life’s biggest challenges. How they wonder what the hell they have got themselves into. How children will find a battery to put in their mouths, no matter how hard you watch them. Owens captures that special brand of light sarcasm that every long term couple seems to have developed with each other - the one that can turn barbed at a moment's notice. And he paints family life in such wonderful, technicolour hilarity. Several times I had a fit of the sniggers and had to compose myself while reading on the bus. And then it deals with the big issues. Whether being a stay at home dad makes you less of a man (spoiler alert - it doesn’t), whether infertility makes it OK to get secretly mad at pregnant ladies (it does, just a little bit) and if it is entirely legitimate to turn your garage into a games room (the jury is out on that one). I just loved every cotton-picking minute of it. It was a quick but gorgeous read. And its out now, so go get your hands on it. Damien Owens is one of the funniest people on Twitter at the moment. But I think there's a skill in witty one-liners and social commentary that doesn't quite translate into a genuinely funny novel. Well, plenty of others seemed to like it but the comedy just didn't really work for me, sorry. For what it's worth there's something to be said for actually finishing it and giving it two stars which in Goodreads terms means I thought "it was ok". I rarely give low ratings because I usually abandon a Damien Owens is one of the funniest people on Twitter at the moment. But I think there's a skill in witty one-liners and social commentary that doesn't quite translate into a genuinely funny novel. Well, plenty of others seemed to like it but the comedy just didn't really work for me, sorry. I knew Damien was a great writer before I started this book but if I hadn't known that before I would be aware now. Damien Owens is a master of dialogue and this book is no exception. Beautifully written and an absolute pleasure to read. Would translate well into a tv series. I'd love to see these characters on screen. I didn't want this book to end. Not usually my genre of choice but I gave this a try on Pigeonhole. The characters were very believable although (call me an optimist!) it felt like quite a depressing portrayal of modern relationships! Definitely worth a read. just finished reading this via Pigeonhole and loved it. it has a fair amount of humour and some of the descriptions are classic and I could just imagine the events. It is about 3 couples and a defining moment in each couples lives. I read this book courtesy of the Pigeonhole. I found it numerous in parts, following the lives of three couples. There interaction was typical in young married couples. Their problem could be extreme in part but overall the outcome was great. And a relatable story. Engaging read perfect for a lazy Sunday or a beach read. I was disappointed when it ended. I just finished this book on Pigeonhole, and it’s a great light read with a lot of laugh out loud moments! The author has such a natural style and the couples are realistic and relatable throughout. I loved the down-to-earth nature of the book. It's realistic and shows a slice of married life for what it is; the humour, the pathos, and sometimes the downright ridiculousness of it all! I was chuckling throughout, alternating at points with frustration at the spouses, and almost shouting at them to just communicate! But that's (married) life ... I thoroughly enjoyed the book. Damien Owens' style is very readable, and I'll be on the lookout for more of his work. Damien Owens was born in Monaghan, Ireland, in 1971. His first novel, Dead Cat Bounce was published in 2001, and was followed a year later by Peter and Mary Have a Row. In 2008, The Bright Side was published under the name Alex Coleman. A second Alex Coleman novel, Little Black Everything, appeared in 2009. He also created and wrote a TV comedy/drama called Trivia, two series of which were broadcas Damien Owens was born in Monaghan, Ireland, in 1971. His first novel, Dead Cat Bounce was published in 2001, and was followed a year later by Peter and Mary Have a Row. In 2008, The Bright Side was published under the name Alex Coleman. A second Alex Coleman novel, Little Black Everything, appeared in 2009. He also created and wrote a TV comedy/drama called Trivia, two series of which were broadcast by RTE (Ireland) in 2011 and 2012. In addition, he wrote several episodes of the animated children’s show Brain Freeze, which has been broadcast by RTE and CBBC and acquired for international distribution by Aardman Animations. He has also worked in radio, writing for the Newstalk comedy news show, You Couldn’t Make It Up.